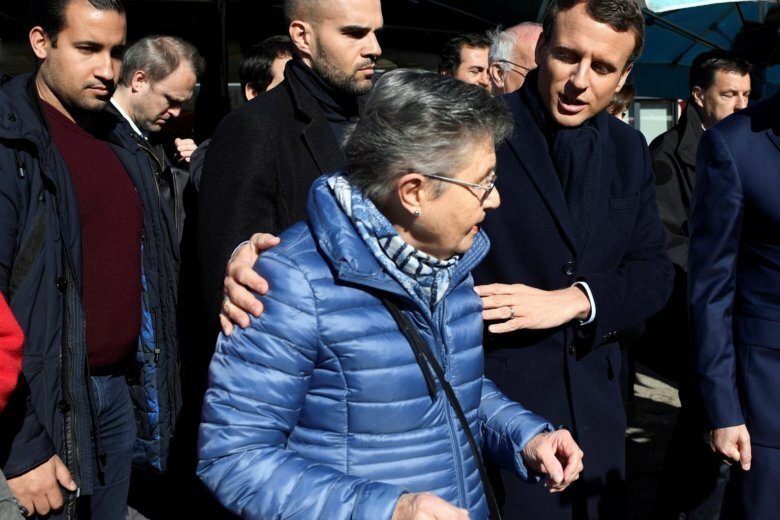 PARIS (AP) — A French investigative website has published a photo of one of President Emmanuel Macron’s former security aides posing with a gun and a waitress during a campaign stop amid France’s 2017 election — without any known authorization to be armed. The report by Mediapart raised new questions about 27-year old Alexandre Benalla, his role in Macron’s campaign and in the presidency itself. The same aide was identified in July in an online video as the man beating a protester during France’s May Day protests. Benalla’s association with Macron has triggered the French leader’s biggest political crisis. Benalla was subsequently fired after the May Day beating and has been handed preliminary charges for violence. But critics wondered how someone so close to the country’s leader could beat up a protester and get off initially with light treatment. The president’s top aides had suspended Benalla for only two weeks at the time, firing him only after an explosion of public outrage. Late Monday, Mediapart published a photo of Benalla and two other security guards posing with a waitress. Benalla is seen holding a gun. France has strict gun control laws and the picture with the waitress seems to contradict several claims by Benalla. In July, Benalla told the newspaper Le Monde that he wasn’t armed during the 2017 French presidential campaign. Last week, Benalla told a Senate investigative committee that he was never Macron’s bodyguard, even during the presidential campaign, but just a person who organized outings. He appeared to be one, however, seen often at Macron’s side, ever-watchful and clearing a path for the candidate in crowds. Asked in the Le Monde interview whether he carried a gun before Macron became president, he replied “No” because he had no permit. Police headquarters accorded him a permit but “only in (campaign) headquarters,” he said. When asked if he ever carried the gun outside, he said, “No, never,” citing a risk to Macron’s reputation. But Mediapart printed a photo dating from a late-night dinner in Poitiers after a campaign stop on April 28, 2017, showing a waitress, her face blurred, posing in the midst of three security guards, including Benalla — who holds a pistol pointed inward to the group. It said the selfie was taken by the waitress in an alcove where they ate. Another photo showed the waitress with Macron, who dined in another closed alcove. Benalla told the waitress there was a “surprise” in the selfie, according to Mediapart, which also reported that she told her boss of the incident and he asked her not to share the photo. Mediapart said the weapon was apparently a Glock, the kind Benalla was authorized to carry only inside campaign headquarters. Mediapart did not identify the waitress or say how it obtained the photo. According to the police chief’s former top aide, Yanne Drouet, Benalla was only authorized in October 2017 to carry a weapon after failed previous requests. Benalla refused to explain to the Senate panel any potential threats to himself, saying the question was off-limits because it overlapped the judicial investigation.